One of my favorite design styles is mid-century modern. Classified by flat planes, expanses of glass, simple forms and organic influences, this style is all about pieces that are sleek and timeless. This period was also an important era for furniture design, as some of the most iconic pieces were created during this time. The mid 20th century introduced some of the most iconic chairs and these chairs are still as relevant and popular as they were when they were first introduced. Today, I want to dive into 5 of my favorite chairs and share some ideas on the best places to use them in your home. 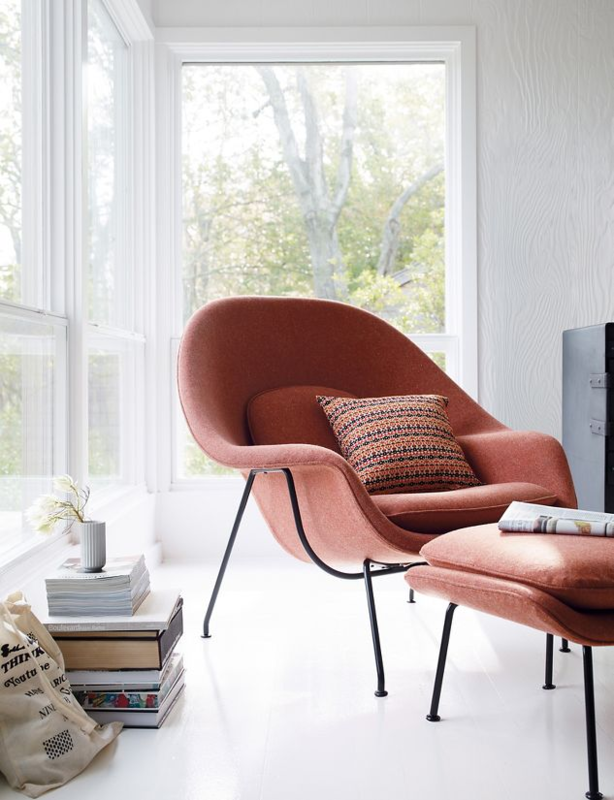 Whether you’re looking for a cozy chair for your office or one for a sunny corner in your living room, you may want to consider using one of these iconic chairs. Created in 1956 by Eero Saarinen, the tulip chair is an organic piece with a unique shape unlike any other. The shape of the chair resembles the tulip flower coming up from the floor and blooming out, which is how it got its name. But it’s not just the shape that makes this chair iconic. It’s also the design. The use of both curved and straight lines give the chair an almost futuristic feel – like something you would see in the Jetsons. The tulip chair is typically used at a dining table or as a desk chair because it only has one leg and it keeps everything under the table a lot less cluttered. Shortly before the tulip chair was created, another iconic chair was coming onto the design scene – the womb chair. The womb chair was inspired by Florence Knoll who wanted a chair that “is like a basket full of pillows”. Her vision was brought to life by Eero Saarinen, the same Finnish-American designer who designed the tulip chair. It included a curved inner frame that followed the mold of the human body so it would provide comfort naturally. The gentle movement of the lines makes it a perfect statement piece for any living or entertaining space. And it’s definitely a chair your guests will want to sit in because it really is comfy! The womb chair would also be great in a cozy corner in your office or bedroom. The wishbone chair, crafted by Hans J. Wegner in the late 1940’s, is one of the most famous symbols of Danish furniture design. Known for his ability to bring together form and function, the ‘Y’ back shape was used in order provide comfortable, yet minimal back support. Its similarity to the shape of the wishbone inspired the chair’s name. The wood frame, paper cord seat, and simple design highlight how you can have luxurious, ergonomically designed furniture without sacrificing the visual appeal. 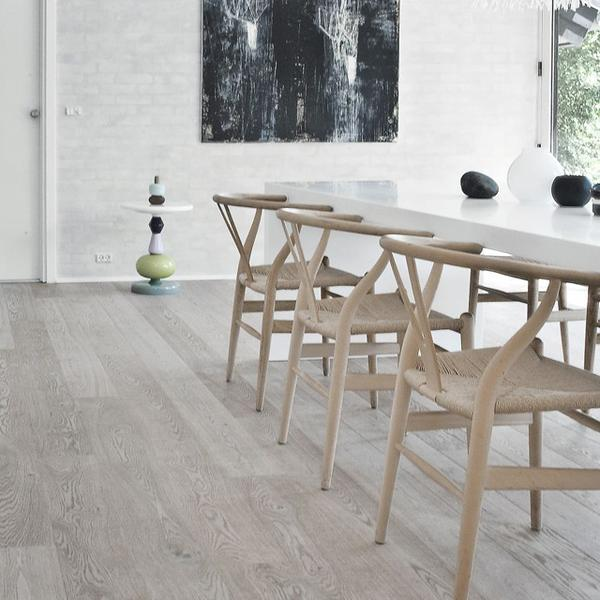 Because of the natural materials used, it’s a versatile piece that can feel modern or more traditional. Though the wishbone chair is typically used for indoor dining, don’t be afraid to throw a cushion on it and use it in an outdoor space! This chair was originally designed by Ludwig Mies van der Rohe as part of the German pavilion at the Barcelona Exposition in 1929, where it got its name. Drawing inspiration from an Egyptian folding stool, he wanted to design a chair that was both luxurious and comfortable – something fit for the King and Queen of Spain to sit in. Though they never sat in the chairs, the design style quickly became popular with the wealthy who used the chair to as a status symbol. The Barcelona chair is very much a statement piece for your home and works really well in a living space or office. The slightly industrial feel of the frame paired with the luxurious leather seat is modern and timeless. Though the chair was redesigned for production in the 1950’s, it’s been manufactured the same way since then which indicates how iconic the chair is. Arguably one of the most famous chairs in American design, the Eames chair is a staple of mid-century modern furniture. Designed by Charles and Ray Eames in 1956, the chair was a response to the spare and minimalist furniture that was popular at the time. It was designed to show how furniture can be modern and comfortable at the same time. The simple design of molded plywood and leather upholstery give this chair a more masculine feel, but it’s still very luxurious. 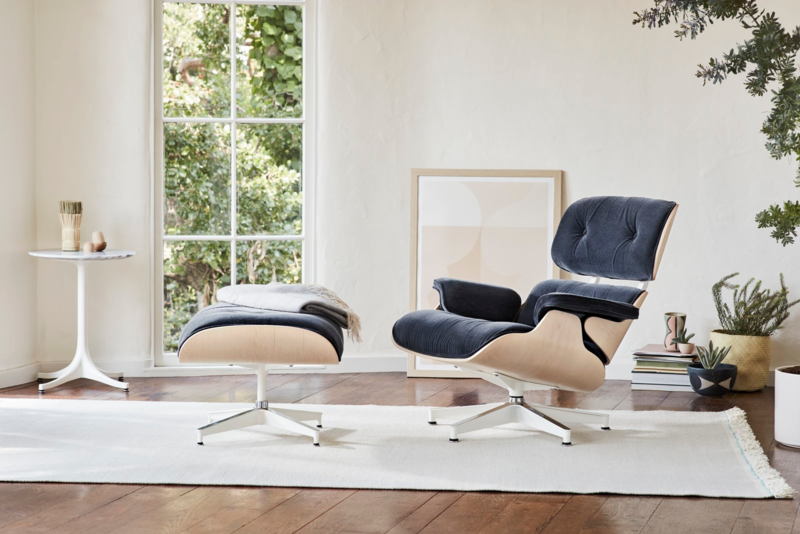 The Eames chair is typically paired with an ottoman in a living area and is a great chair to kick off your shoes and relax in. I like to think of it as the perfect lounging chair. Each one of these chairs was so innovative and different from what was available at the time that it’s easy to see why they’ve become so iconic. The clean lines and organic shapes make them versatile pieces that are easy to mix with other design styles. So whether you’re thinking about adding one of these chairs into your current design or into a new space, these chairs will definitely give the space a timeless, sophisticated and modern feel. Now that I’ve shared my favorites, I want to know yours! Comment below to let me know which one of the styles above is your favorite iconic chair.